What is a RAR archive? Newsbin Pro has two distinct kinds of search features. You can search within an individual group, or through all newsgroups simultaneously. Searching globally with Newsbin is a paid service if you do not have a Usenet Storm account, but it is included as part of Newsbin's free 15-day trial. Once that runs out, you'll have to pay for it or get newsgroup access through Usenet Storm. 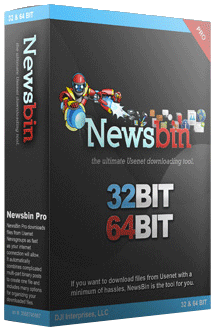 Newsbin Pro's global search is designed to scour all of the Usenet newsgroups simultaneously. This can include ones that you haven't even subscribed to. The feature works by accessing a universal database of all the most popular content on Usenet. This database resides on Newsbin's own servers. While it includes a great deal of content, it doesn't include everything. For instance, news groups that are based on images are not among those contained in the database. You'll notice that Newsbin has a separate tab for searches. You can open as many of these windows as you would like. Once you've completed a search, the behavior is identical to that of a list of posts when browsing with the software. 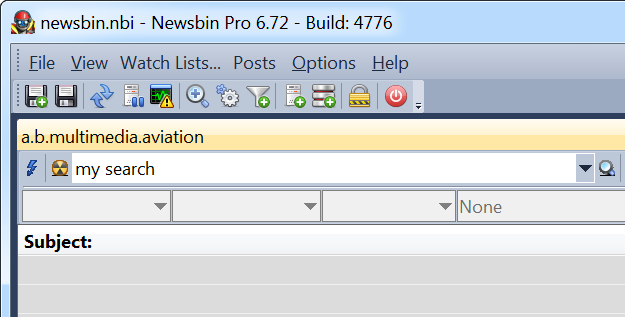 Searching is the easiest, fastest, and most rewarding way of getting started with Newsbin Pro. All you have to do is type, search, and download the files you like. In Newsbin, at the top left you will see a search box. In that box, type a subject that you want to find and press Enter. The results will be shown in the box just below where you typed. To download files, just double click on any of the results. Notice that the size of each file is shown beside the subject. If size is important to you, you can also sort the results by size. The file you select will be put in the lower panel where it will show the download progress. The files you selected will be shown in the lower panel. You can pause downloads, change the order for what should be retrieved first, delete files you changed your mind about, or just watch the progress of your downloads. When a download completes it will be moved to the "Files List" tab at the very bottom, and you can click there to see everything that has finished. The column "Download Path" shows where the files are on your computer. Newsbin filters allow you to create filters based on commonly found strings in newsgroups. You can also decide which kind of content should be displayed and what can be excluded automatically. This topic is covered in depth in the chapter The Basics of Navigating Newsbin Pro under the subheading of Main Menu: Filters. Newsbin Pro has support for finding results in local headers as well. News groups can have anywhere from thousands to millions or even billions of posts. While the global search feature has its own separate tab, the news group specific option can be found at the top of any open group. The headers need to have been already downloaded for you to search through them. There are a couple of different ways to accomplish this. The newsreader can either use keywords or a filter profile. You basically type a keyword into the header search field, which should be rather obvious, but there's a bit more to know. Firstly, Newsbin will remember your searches, so if you open another tab with a different newsgroup, you can find that same phrase again and again. Your should remember this if privacy is important. In addition, Newsbin Pro can create an index of this data which will allow matches themselves to be found more quickly. Newsbin has support for a second way, which requires that you create a filter profile. This can be done under the Options menu. At the top of the window, there will be a tool bar aligned with the search field. The green button that looks like an on switch enables the filter features. The system can then load and apply a custom filter for searching through the newsgroup. This can be used to store criteria that you use very often. For those that are interesting in either joining discussions or posting binary files themselves, that can be done with the Newsbin software albeit in a far more limited way than utilities that are designed exclusively for posting. Not every news server allows users to upload. For those that are interested, finding a news server that allows users to painlessly upload and post material to Usenet will be a priority. In addition, some news servers that do allow users to upload first require that the user enables that functionality in their system, or contact support, before doing so. 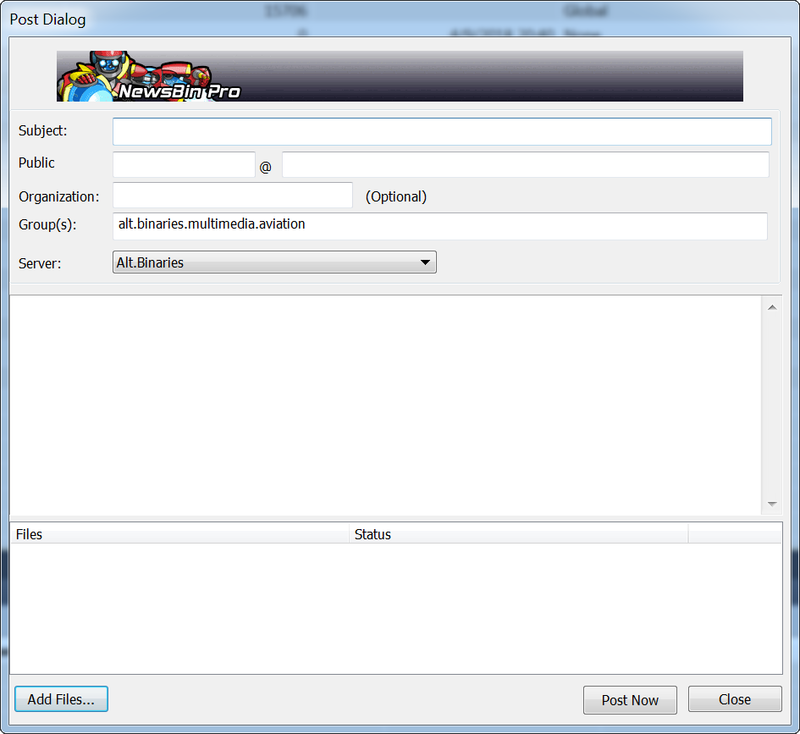 Newsbin is equipped with the basic ability to post single binary files and actual messages. This is accomplished by going to the Group Tab and then using the right-click menu to bring up a list of options. One of them will be Post to Group. There are a couple of things to note here. First, Newsbin Pro can post to multiple news groups at the same time. You simply need to separate each group with a comma. Secondly, you need to fill in an email address, but it shouldn't be your personal email address, or anyone else’s for that matter unless you seriously don’t like them. It is common for these addresses to be harvested for e-mail spam lists. At the bottom left-hand corner of the window, you'll see an option to Add File. You'll simply find the file on your disk and attach it to the new message. Newsbin Pro will tke care of posting the message and attachment to the news server automatically. For those that want to reply to specific posts, that can be done using the right-click menu within a newsgroup tab. While Newsbin allows users to post, there are other programs that are optimized for the purpose of frequent posting. If you intend to become a frequent Usenet contributor, be sure to protect your privacy, and find a popular Usenet uploader like Power-Post. The developers of Newsbin Pro have a free app for using your Android Phone to control the newsreader remotely! The app is still in development, however, so there may be some hiccups or gaps in support along the way. Nonetheless, many folks are enjoying this functionality and using it successfully. In order to install a third-party app, you will first have to enable the feature on your smartphone or tablet. Simply load up settings on your Android phone, and select Lock Screen / Security. Where it says Unknown Sources, you want to enable that option. Using your Android device, you will need to download the Newsbin Pro NBRemote APK. Once the APK has been downloaded, you can launch it, and NBRemote will be installed on your device. After you launch Newsbin Pro NBRemote for the first time, you'll need to add your computer to the system. In the top menu, click Add Computer. The information that needs to be added to NBRemote can be found in your Newsbin program. Load it up, click Options from the main menu then select Settings. Under settings, you will find an option for Remote Control. This will give you the that information you need to let your phone know which computer it should be making connections to. After you fill in the required information, click Connect on your phone. Newsbin Pro's NBRemote will then attempt to connect to your computer. You can now access Newsbin from your Android device! Newsbin is a standalone program and there are some inhibiting factors that can make it run more slowly. Users with older computers or slower CPU's, slow hard drives, or other issues can still get the most out of the software by knowing a few tweaks. One huge limiting factor for any newsreader is disk access speeds. Newsbin Pro is responsible for writing dozens of files simultaneously, often repairing, unpacking, and piecing them back together at the same time. For those that have multiple hard drives installed, spreading work and disk calls across different high-performance disks will greatly improve speed. You'll want to set your antivirus software to disregard folders for pending and completed Newsbin downloads if you're noticing performance lags. You should always not just scan suspicious files, but every file you download from anywhere. However, trying to do this during the download process can significantly slow down a computer that is already close to the edge. If the download speeds from your news server aren't as fast you'd thought they be, try hardwiring your internet connection with an ethernet cord. You should notice an immediate improvement. Thumbnails are cool for modern super-fast CPUs, but they will slow down processing time significantly if your newsreader program is downloading images. You should notice speed improvements if you close the Downloads tab since this is one of the features that needs to be constantly updated when you're downloading data. You can try increasing the Chunk Cache size to help improve hard drive bottlenecks. This can be especially intensive while your newsreader software is in the unrar and repair process. * Payment by mail is accepted.